It’s hard to believe that anyone would pass up onion rings…for frozen anything. I love, love, love onion rings! But still, I was surprised at all with his selection or substitution. 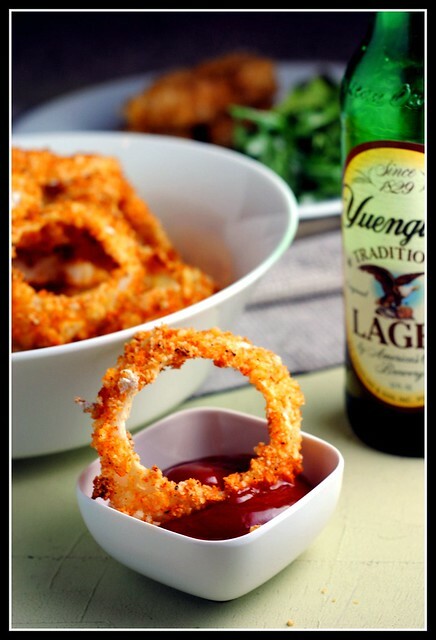 With Super Bowl Sunday this weekend, lightened up onion rings would be the perfect compliment to any game day spread. Finger food without the grease! Or guilt. When I first planned to make homemade onion rings, I had planned to use a recipe that involved heating oil on a baking sheet and baking the onion rings in the oil. That recipe is Cook’s Illustrated and has PHENOMENAL reviews. I knew they would be great, but I dug a little deeper into my stockpiles of old recipes and decided to omit the oil all together and bake to a crispy perfection on wire racks. I ended up combining the two recipes and used aspects from each that I felt would yield the best results. While these were my first attempt at a onion rings, I don’t see any reason to try any other way! In a food processor, pulse together the panko and kettle chips and transfer to a shallow dish. Season with salt, pepper, and paprika. Dip each onion ring in flour, then the egg/buttermilk mixture, and lastly in the chips/panko to coat. Continue this process with each of the rings. Bake for 15-20 minutes, until golden. Yield: 8 servings (about 12 rings each). Result: Crunchy is right! I won’t pretend these are the quickest things to make – be sure to commit to these when you’re not strapped for time. Nothing difficult, it just takes some patience 🙂 These are absolutely wonderful – onion ring lovers rejoice! Oil-free faux fried food! Enjoy! It’s the last day of January – crazy! 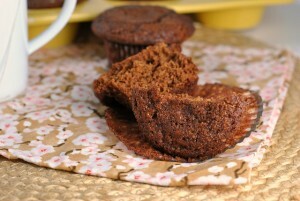 But, come back tomorrow for a fun announcement and a great, heart-healthy recipe! Workout then off to work and to teach! I love it! What a great superbowl appetizer. Mmm! Every time my boss goes to costco, he likes to tell tales of how much money he saved. Don’t mess with my heart woman! These look amazing and crunchy and delicious. Great. Now I want onion rings for breakfast. I made these same rings…and yes…quite a bit of work…but they really were yummy. Awesome! I’ll have to make them soon. I know Andy would love them! We’re a family of two (plus a pup) and Costco is our favorite place to shop. They have wonderful produce and we buy our meat in bulk and then freeze what we don’t use right away. Milk and eggs are the best price around. And their electronics, and wine…I could go on and on! My in-laws gave us their extra costco card – we haven’t been there yet! We also have a BJs membership – we buy beauty products, Naked Green Juice, tuna, clams and sometimes produce (like bananas when I need to restock my frozen banana stock). 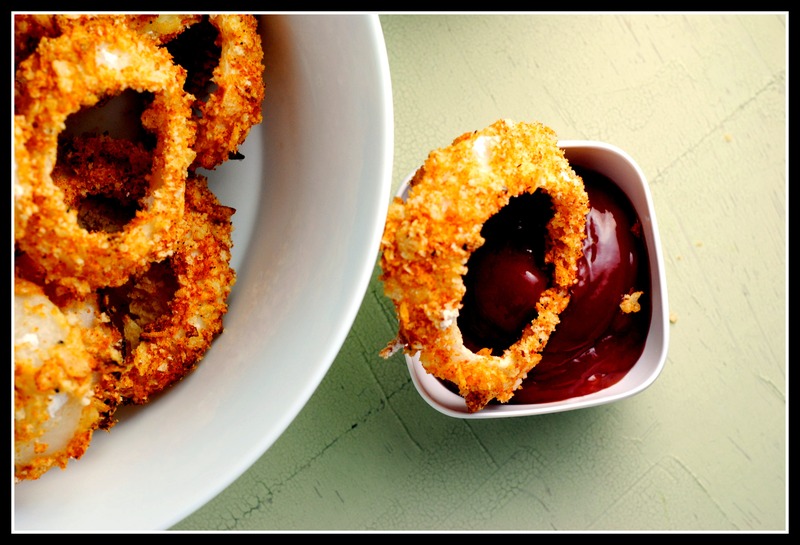 I love onion rings – so delicious! These look just delicious!! 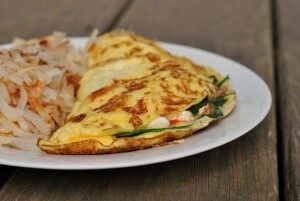 I love how you decided to change around recipes and come up with something even healthier! Haha…we belong to Costco, and I agree– not that practical for just a two-person household! We DO get our frozen berries there for smoothies though, and it’s much more cost effective than buying them at the regular g.store! Oh man, these look amazing!!!! Thanks for sharing, I can’t wait to make these! Hey Nicole! I just got back from vacation and am catching up on my blog reading! 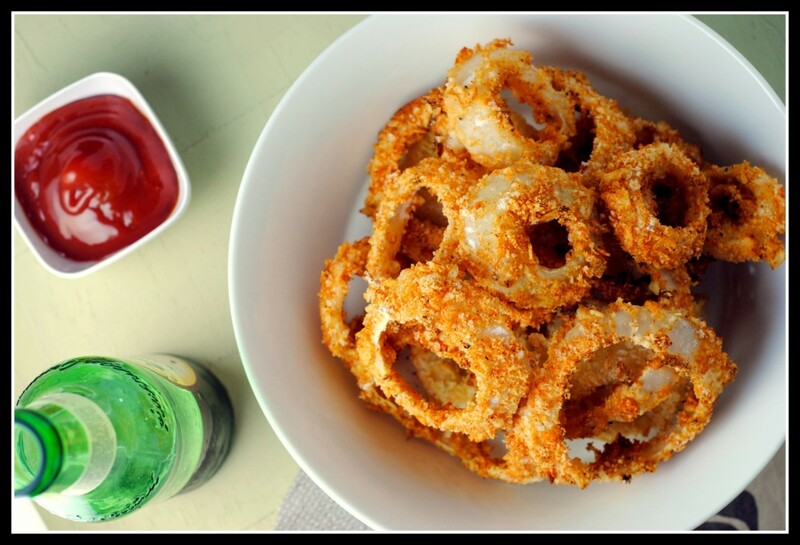 I am a huge fan of onion rings and I know I would really go crazy for your lightened up version…definitely the perfect pary food for this weekend! Those onion rings look amazing! I can’t wait to make them. LOL. I’m totally laughing at what your husband said in Costco. I give my husband a couple years before he’s like that too. My hubby’s still somewhat polite when he tells me he doesn’t think he’ll like what I’m making, so he says basically the same thing, but tries to disguise it, haha. That being said, we both looooove onion rings. I can’t wait to try baking some!! I love onion rings. Like, a lot. I get unreasonably excited when I see them on a menu, and I HAVE to have them. I’ve been meaning to make my own forever, but I just haven’t gotten to it yet. And Costco – I freaking love it there. My parent’s passed on one of their memberships to me (they both had one, and always go together so there was no point in having two), and it’s been the highlight of my life ever since. They sell giant bags of quinoa so cheap. I love it. I wanted to let you know that I made your Buffalo Chicken Enchiladas and my family loves them. I have three little kids and they requested them for dinner tonight. Even better is I prepare my chicken with the sauces in the crockpot so all I have to do is put it all together and bake in the oven. Thanks for all of your great recipes. I love onion rings– even more than fries. I love them so, so much. 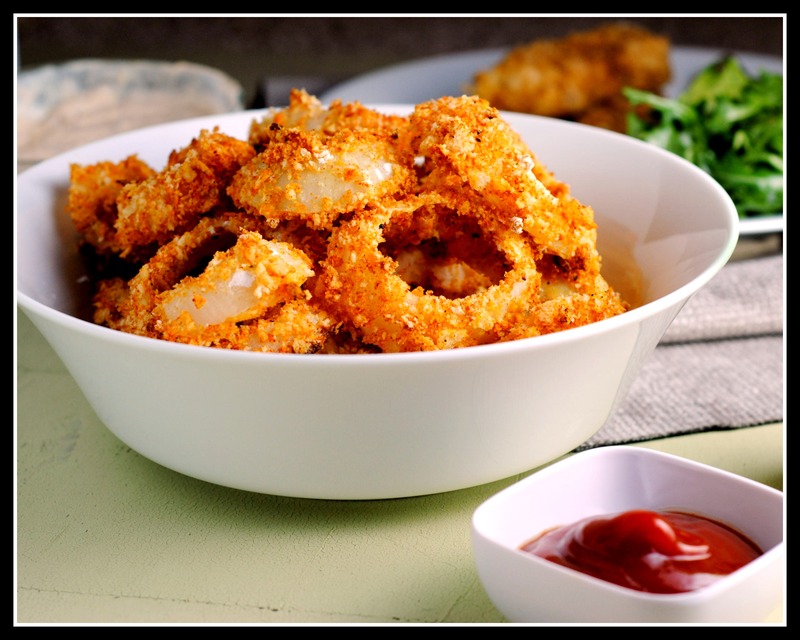 Your pictures are making me go mad with onion ring cravings! They look perfectly crunchy despite not being deep-fried. Those are some really nice looking onion rings! 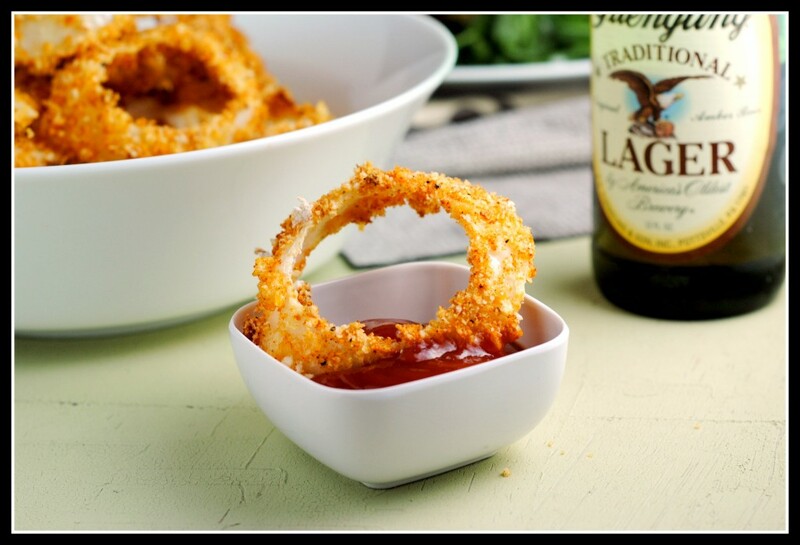 WHOA, Nicole, on your halibut fish sticks recipe, you were NOT KIDDING about these delicious-looking onion rings! This meal may become your hidden Ace, we think!